The tour, which has made stops in other Asian cities, came as a surprise for many as it finally made it back to shore after a long haul. Some overseas fans quickly book their flights to Malaysia upon the announcement to not miss the occasion. 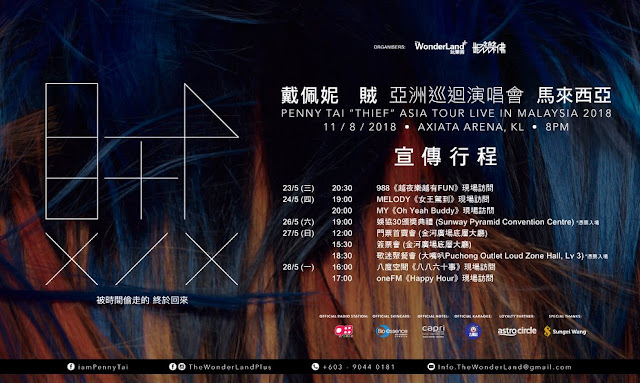 Throughout 18 years of her music career, Penny has released a total of 12 albums. Almost all her songs are written, composed and produced by herself that holds a special place in the hearts of her fans at home, from the broken-hearted numbers like How? (Zen Yang), The Love You Want (Ni Yao De Ai), Crazy Love (Ai Feng Le); to the heart-warming Fly Ahead (Wang Qian Fei), Multiflora Rose (Ye Qiang Wei), One Person’s Luggage (Yi Ge Ren De Lu Xing); to the more upbeat feel-good Whistleblowing (Cui Bi Bi), Strawberry Bread (Cai Mei Mian Bao), Lazy Wanderer (Lan Ren Man You), and many more from her discography. For almost 2 decades, her songs are always there for her fans, in a way they took away the youth, memories, laughter and tears of her fans, this homecoming concert is where her fans get to take it all back in one night. Her effort and talent in music has earned recognitions in the industry. 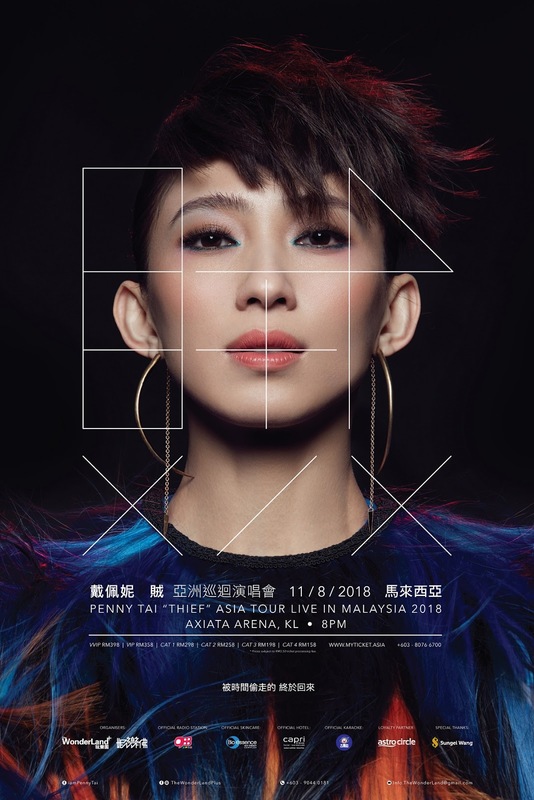 Penny has been a recipient of the Golden Melody Awards in Taiwan for a few times, dubbed the Grammys of the Chinese-speaking world, including Best Album Producer and Best Female Artiste, making her one of the most successful Malaysian artistes. Tickets purchased at the launch come with exclusive “Thief” folders. 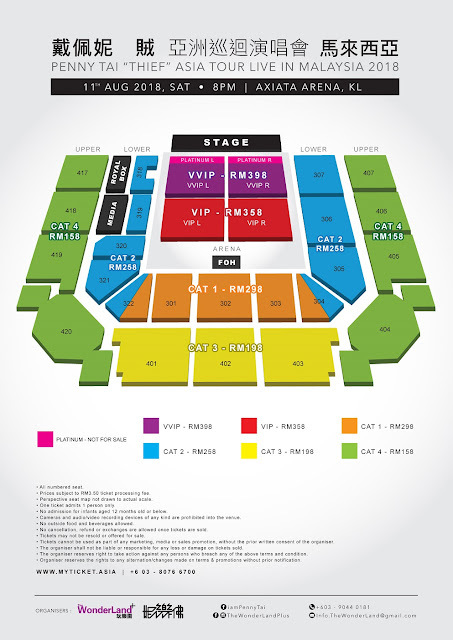 Fans who purchased VVIP ticket are entitled to a set of 3 folders, while fans who purchased other ticket categories will get to select 1 (one) folder in black or white, while stocks last. First 300 ticket purchasers will receive a Bio-Essence trial kit worth RM32.90. Following the new government’s announcement on reduction of GST rate to 0%, online ticket sales will officially begin on 1st of June at 12pm through www.myticket.asia. As the date of ticket launch is fixed, the organizers will bear the 6% GST on tickets purchased at the launch, meaning ticket prices at the launch and online will be the same. Penny Tai “Thief” Asia Tour Live in Malaysia 2018 is organised by The WonderLand+ and Neverfall, with 988 as the Official Radio Station, Bio-Essence as the Official Skincare, Capri by Fraser Kuala Lumpur as the Official Hotel, Loudspeaker as the Official Karaoke, Astro Circle as the Loyalty Partner and Special Thanks to Sungei Wang.